A protein is injected into specific muscle groups on the face to relax those muscles. 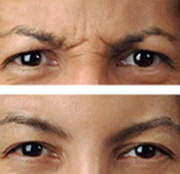 Once they are relaxed, the expression lines on the face soften or disappear. The effects of Botox last about 4 months. The photos show before (top) and after (bottom) botox treatment. 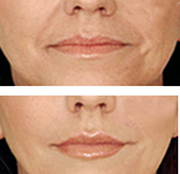 Products such as Restylane and Radiesse are utilized to replace lost volume in the face and to correct lines around the lips, mouth, nose, and “jowls”. The photos show before (top) and after (bottom) treatment with fillers. This laser-like procedure involves the use of specific wavelengths of light to destroy certain superficial flaws on the skin such as broken capillaries, sunspots or age spots and facial redness as seen with rosacea. 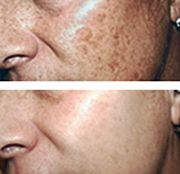 The photos show before (top) and after (bottom) IPL treatment. This involves the injection of a strong salt solution into spider veins on the legs. The solution irritates the vein such that it scars down and is no longer visible. 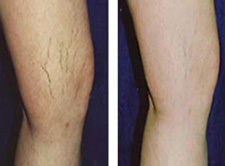 The photos show before (left) and after (right) sclerotherapy treatment. This skin resurfacing procedure utilizes tiny needles to create microscopic injuries in the skin, allowing for new collagen formation and the creation of channels for topical solutions to penetrate deeper and work more effectively. 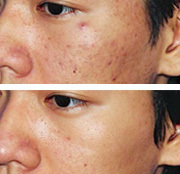 The photos show before (top) and after (bottom) micro-needling treatment for acne scars.